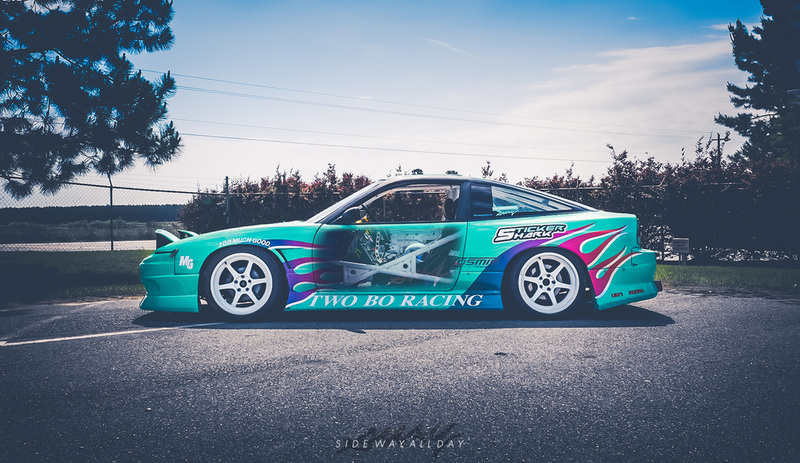 Inspired by classic hot-rod style flames and the Japanese interpretation of American style throughout the years, Dustin’s s13 would be something you could see in a spread of Drift Tengoku magazine. This timeless style just seems to work effectively showing off sponsor’s logos and giving the eyes a chance to rest in the negative space. Furthermore, the colors are reminiscent of a throwback San Antonio Spurs' color palette, leaning towards an 90’s urban vibe. We can dig it. Living in Macon, Georgia and growing up closely with his dad, Dustin adopted the love of hot-rodding and painting flames. Much like his team name, “Two Bo Racing,” is the simply a way of saying “Two Boy Racing” with a southern draw. Cosmis Racing Wheels jumped on board this season, providing a new set of XT-006Rs that look super clean and aggressive. StickerShark, a longtime sponsor and close friend of Dustin, came through with the vinyl and turned this car around just in time for the OSW/SGMP “Takeover” Event this past few weeks for it’s debut and shakedown day. So far, it seems like the car is becoming well received as more photos are surfacing the internets. Enjoy this set shot by our friend Rion Morse. And stay tuned for the next installment of this feature as we learn more about Dustin’s stories of growing up with hot-rods, falling in love with drifting, dealing with haters, as usual and his plans for this year’s drift season. Like, comment and check out the links below to stay up on Dustin’s social media updates. Until next time!